NASA's Cassini space probe, which has been exploring the Saturn system since 2004, recently completed its most daring maneuver to date. On October 9th, the spacecraft passed just 16 miles above the surface of Saturn's moon, Enceladus. Compare that altitude to those of some familiar stuff in Earth's orbit. The International Space Station hovers about 150 miles above the surface of the Earth. The Hubble telescope is in orbit 300 miles out. The Cassini maneuver, what NASA refers to as a "deep plume run", has already returned some pretty amazing images (see pic below), but the primary goal of this sweep was to analyze material spewing from icy plumes around the moon's South Pole. A thorough analysis may show there's water under the surface. 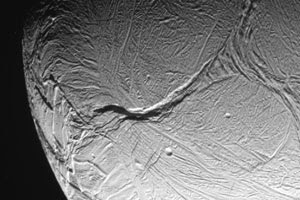 If there is water, it would be the latest building block of life on Enceladus. Other clues include geologic activity, water ice, warmth and organic matter (like carbon dioxide and methane). Previously, a plume run at 30 miles above the surface of Enceladus was "undermined" by an instrument malfunction. But according to the Cassini mission blog, "everything went great" this time around.